It’s a great tool but it doesn’t integrate that nicely with OSX. You can configure it with the ~/.tmux.conf to your prefered environment. But even then it doesn’t feel quite right. For example for scrolling you have to go through a lot of hoops. 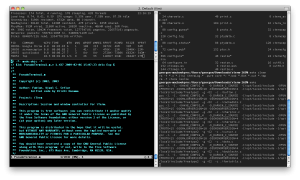 So tmux is great if you stick to Linux but not that great if you run OSX natively. My main feature request was having a terminal that runs smoothly and supports transparancy with split terminal on OSX. Enters iTerm2. It’s a native OSX app that allows you to run split terminals easily, with scrolling and all the OSX GUI-gimmick support built-in. iTerm2 dims the pane that is inactive which gives you immediate visual feedback on your active console. It alllows you to define different profiles. It has support for transparent terminal windows (great if you want to debug a running app). You can easily split the console window with Command + D or ShiftCommand + D.
iTerm2 also allows you to define a set of shortcuts and integrates the “select and copy” that I’ve been used to from working with Linux devices. It is a free download. If you plan on using it intensively you might consider donating to the author. So far I replaced the default OSX Terminal app with iTerm2 and I’ve not discovered any issues. 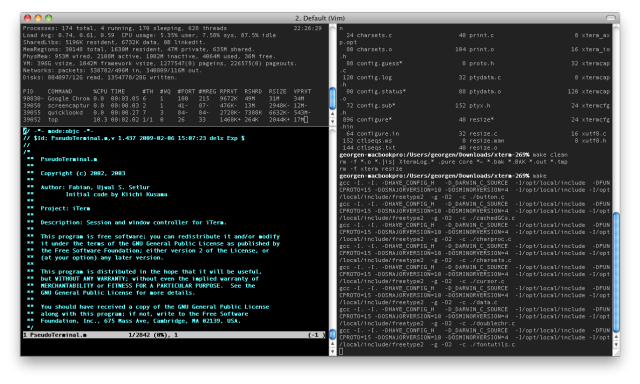 It makes running terminal windows from OSX far more easier and convenient.